This salad definitely fits the bill. It is so full of flavor! In a large bowl, whisk together mint, sugar, lime zest, lime juice, and water. 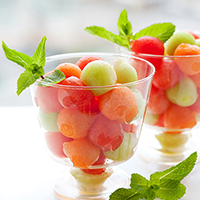 Cut melons into cubes or into balls with a melon baller. Add to the bowl and toss to combine well. Cover and refrigerate for at least 3 to 4 hours to allow the flavors to combine.